The term “Data Visualization” has increasingly becoming an essential element in higher education. Universities, faculty and students have turned to data visualisation software to communicate across an array of mediums. Moreover, data visualization makes it easier for an audience to understand data clearly while the user can communicate information more efficiently. Because of its power to communicate, data visualization is becoming more pervasive in higher education. With the existence of various software on the market, the user can choose the best platform needed to aggregate and analyze data, which then can be applied to research, teaching and or development. Impact of the internet on human behavior and social patterns: keywords and crowdsourcing can help to explain people’s online activities, including travel, investments, and business. Human health: predict heart attacks, and, by extension, the same data could potentially prevent them. Cybersecurity: terrorist attacks follow the same formula and can be predicted based on the psychological patterns of the attackers. Financial markets: Data can be used to track financial patterns. Alberto Cairo, Director of the Visualization program at the Center for Computational Science. Using and teaching visualization for communication with general audiences. At CCS, promoting collaboration between students and faculty interested in visualization. Curator of UM’s Visualization website. Exploring the many real – world applications of geographic information systems. 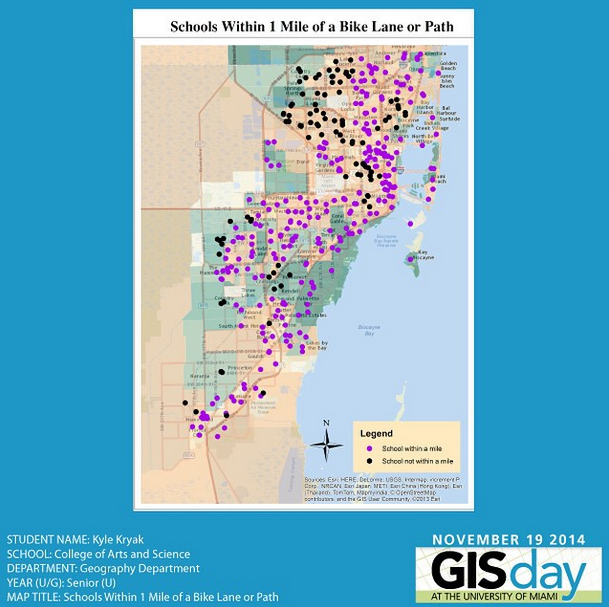 The use of GIS to enhance presentations and maximize the impact of research across the scholarly landscape. Topics explored: Malaria trend along the Pacific Coast of Colombia, Diversity and Social Capital of Black Neighborhoods in Miami-Dade County, Accident Density in Miami – Dade County from 2003 – 2010, and Brazilian Amazon Degradation. School of Communication: The School is launching a new track in its MFA program about visualization and mapping for communication. School of Business Administration Master’s in Business Analytics, Students gain the intellectual capital and methodical tactics to approach big data applications with a keen understanding and unique perspective. With the ability to make important business inferences, graduates of the program are well positioned to help companies realize a return on their investment. The school is launching a new track in its MS.Arch Computational and Embedded Technology about computational design, programming, digital design and fabrication. Coordinator is Ju Hong Park Assistant Professor. Data Visualization software gives the user the ability to processes information and present data which can be represented visually through formats either pictorially or graphically. Each software offers a range from simple charts and graphs to complex flow charts and geographical maps. The essential objective is to create a visual representation of patterns, trends and outlines that can be engaged, understood and shared with audiences more effectively and efficiently. Many of these visualizations are interactive, allowing users to adjust settings and see the impact in real-time. When more and more data is collected and analyzed the use of data visualization software helps to enhance analytical results to differentiate between numerous variables, communicate concepts, predict trends past, present and even future. How can one make data powerful? How do we illustrate the meaning, how do you explain a story, how do we share a story? What classifies good data visualization? Let’s take for example, a number set, 8434287493492248084. How many 8’s are there? Okay, try again 8434287493492248084. See how a simple color change makes comprehension instant. Color is one of several pre-attentive attributes. Like size, orientation or flicker, these are visual clues that enable the human brain to process within 250 milliseconds. Imagine our objective is not to look for a specific number, but a pattern, we can use color to show correlation, size to show quantity or orientation to show trends. The power of data visualization can also be used to better communicate all sorts of information: processes, hierarchy, anatomy and chronology. A picture is worth a thousands words. Data visualization software enables the user to spot emerging patterns in vast quantities of multi variant data. Traditional tools force users to rely on IT for each section of data and/or are limited by the amount of data which can be handled. Having the ability to explore and share vast amounts of data (big data) on a desktop or mobile device in a dimension free, easy to use application is the key to insight. The goal is to maximize an audience’s retention of relevant information, by providing beyond a passive but more active learning environment. Understanding the data in the right shape for its intended benefit is sometimes problematic. The user must know the context and understand what it is that they are trying to visualize and convey from each data set. Additionally, the tool will only prove valuable if the quality of data is assured. If we are to use the data to make an informed decision that impacts a large audience, the process must be verifiable and reflect the most current of data collection. If not done correctly, that visualization data set will prove to not be valid. The use of specialized software may have a learning curve, thus training/coursework may be required. Leveraging training tools such as Lynda.com can overcome this. The University of Miami just launched a graduate degree of a MFA in Interactive Media with a specialization in Data Journalism and Visualization. The track is a product of a collaboration between the departments of Cinema and Interactive Media, Journalism and Media Management, and Geography. It has a strong focus on visualization and infographics design, technology, visual journalism and storytelling, mapping, and also on analysis and research. Visualization can turn complex problems into simple ones, make patterns obvious and even impossible to miss, can be observed faster than your eyes can move, and accommodate diverse learning styles. Essentially, visualization makes users more productive. For example, dynamic and interactive visualizations can be embedded in online course materials to provide up-to-date data, thus reshaping the traditional content to accommodate both visual and aural learners, something that has not been effortlessly accomplished when utilizing traditional textbooks or excel spreadsheets. 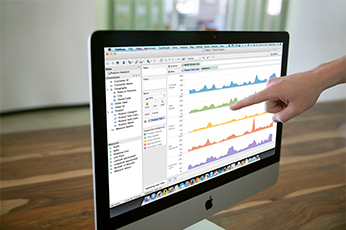 Data visualization opens itself up for multiple ways of representing data graphically. This allows for a single data set to be visualized in unique ways by either individuals or teams. For students, data visualization can be used to describe a phenomenon (occurrence, process, action, and concept) where students present a collection of information ( numbers, formulas, words) from there the depiction of data can be visualized and processed to gain deeper understanding. Students using specialized software such as Tableau, are enticed to learn or apply unfamiliar skills, such as data integration, while at the same time obtaining the inspiration necessary to transform mundane data into appealing visual representations suitable for in class presentations, group projects, and informational displays.